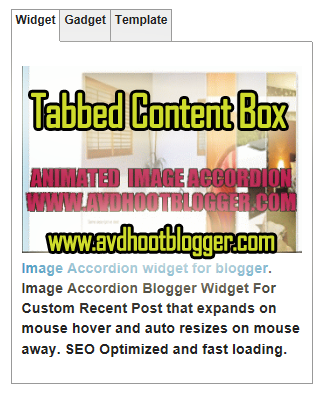 Handsome tabbed content box widget for blogger like Wordpress using CSS and Jquery. You have seen it in Wordpress templates shows 3 tabs with the recent comment, recent post, about me and popular post widget. Pure CSS and Jquery based tabbed content box widget for blogger. We have seen it in Wordpress templates where it shows 3 tabs and shows 3 widgets under the tabs, just like that I coded content box with a tab widget for blogger. Where you will be able to customize it with your any kind of gadget or widget like labels, recent post widget, popular post widget, about me, blog list and like anything. This blogger widget is compatible to work with almost all of the browsers like Opera, Internet Explorer, Google Chrome and Mozilla Firefox. This tabbed content box is completely customizable and coded with pure CSS and Jquery as I have already explained it. So lets start how to build it and insert in blogger. A few things you need to notice. There are few customization like adding your links and images in this tabbed content box widget for blogger. Below is the demo check it out and what are the customizations for this tabbed blogger widget is given. Hide Google Adsense ads from homepage. Pure CSS and Jquery Based. Simply copy and paste code. No need of adding it into the head tag or somewhere else. Just copy the code of this blogger widget and paste anywhere you want. <!-- This Is A CopyRight Code.It Is Free To Use But With HTML Design Code. * This notice must stay intact for use. * Visit http://www.avdhootblogger.com/ for full source code. Image Accordion Blogger Widget For Custom Recent Post that expands on mouse hover and auto resizes on mouse away. SEO Optimized and fast loading. How to place Page or Post title before the Homepage title of blog or website,Blogging tips to add homepage title or blog title after the page title with seo tips. Change the menu name in this code. I have used widget, gadget. Delete them and use your own name of menus. Find the below code and use your own images, links and text . I hope you liked this tabbed content box widget for blogger. Feel free to share and comment. Description : Handsome tabbed content box widget for blogger like Wordpress using CSS and Jquery. You have seen it in Wordpress templates shows 3 tabs with the recent comment, recent post, about me and popular post widget.